Successfully Added Double DIN DVD Player - 7.0 Inch Touchscreen TFT LCD to your Shopping Cart. 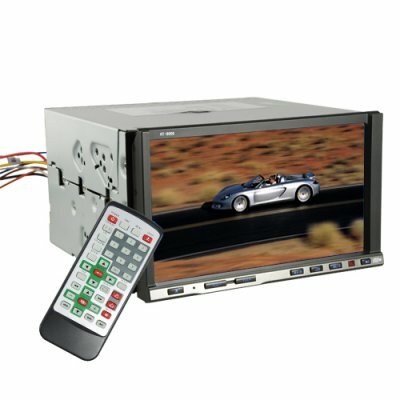 2-DIN Car DVD player and entertainment center with extra large 7 Inch screen. This unit features a wide compatibility of disc and digital media formats as well as a frontside USB port and touch screen for easy control. Other excellent features included a built in TV tuner, SD card reader, a CDC port, and rear view camera input. Combining an excellent design, the latest in entertainment technology, and high performance components, this car multimedia center is a great upgrade for any vehicle (especially if you are on the road a lot). A great wholesale price makes this unit perfect for the resale market, VAR market, or simple personal use. As always, it is only available from your source for wholesale direct from China electronic products, Chinavasion. Primary Function: 2-DIN size vehicle touchscreen DVD + multimedia player with beautiful 7 inch display. Does the product have Bluetooth? The CVEKY-8605-Black does not have Bluetooth functionality. Keep it up, i likr this product which is made from high quality. Estupendo precio y buen funcionamiento. Lo unico que tenia letrero de el cable de entrada de la camara de detras camiado por el de salida tv.